Much changes quickly in sports, and so it is for the Bulls who a few days ago were having visions of championships as they headed for Miami to open the season against the two-time defending champions. So Thursday as the Bulls prepare to play their home opener against the Knicks, also on national TNT, the issue is whether the Bulls can dig themselves out of a tie for last place in the Central Division with Milwaukee. If the playoffs started today, the Bulls would be in the lottery on the point differential tiebreaker. And everyone would figure out a way to blame Carlos Boozer even though he is the team’s leading scorer. Rose and the Bulls return home to host the Knicks on Thursday night. So how is Andrew Wiggins looking? But things did look up for the Bulls Wednesday as they had their best day of the season thus far as the Heat lost to the supposed-to-be-historically bad 76ers, the Nets lost to the Cavaliers and the Pacers were pushed to the last seconds by the Pelicans before Indiana pulled out a victory. That at least left the Bulls tied in the loss column with the Heat. Yes, I may be taking this first week of the NBA season a bit too seriously. But it was already in the NBA, as Marv Albert once famously said, the world of the wild and wacky as the Heat were behind the 76ers 26-4 a day after they led the Bulls by 25 points. Suddenly that Bulls game in Philadelphia Saturday doesn’t look so easy. Someone find out if Michael Carter-Williams is one or two people? But first there’s one more first for the Bulls as Derrick Rose plays his first home game Thursday since his last game in the United Center in April 2012 when he was helped off the court late in the first playoff game against the 76ers. This is becoming old stuff as Chicago media already has chronicled Rose’s first media day press conference since the injury, his first practice, first preseason game, first split double team drive, first injury scare, first missed game in the Southern Hemisphere, first 30-point game, and then Tuesday his first turnover 13 seconds into the game, first basket less than two minutes in, first full court rush about two minutes later and first loss about two hours after that. But, no offense, it was Derrick’s brother, Reggie, after a leg injury. We wish him well as he’s a great support for his brother. But he’s the better Rose these days to be hobbling. Because Chicago awaits Derrick Thursday even if coach Tom Thibodeau is growing a bit weary of these almost daily milestones. Rose also figures to be a lot better Thursday not seeing Miami’s defense, for one thing, which probably is the league’s best trapping the pick and roll, which is the Bulls primary offensive option. That should leave not only more driving lanes but perhaps a bit more room to shoot as Rose was one of seven on threes Tuesday after shooting 44 percent in the preseason. The Bulls also should be better after shooting seven for 26 on threes, allowing 51.4 percent Miami shooting and 11 of 20 threes. Also fouling less as Luol Deng and Jimmy Butler were out in foul trouble when Miami blew open the game in the second quarter. The aggressors get the calls, and a home crowd helps motivate you some to be engaged. And then come the Knicks, who Wednesday blew a 25-point lead at home to the Bucks, and then closed the game in the last two and a half minutes with a 10-2 run to escape. Their new addition, Andrea Bargnani, was three of nine shooting for six points and was only booed sporadically. Knicks fans then relaxed on the way home at the Museum of Subway Odors. Actually, the Knicks are another of the Bulls rivals since it’s not exactly a rivalry yet with Miami until the Bulls actually beat them in the playoffs sometime. The Knicks are in some respects more familiar with former Bulls Tyson Chandler and Metta World Peace in the lineup along with Oak Park native Iman Shumpert, who shares his ACL day with Derrick. The Bulls and Knicks were fun last season, though more so for the Bulls, who won all four games. There were five players ejected in the first two games, and then the Bulls broke the Knicks’ 13-game winning streak in an overtime win in the fourth game. J.R. Smith fouled out of two of the four games while Carmelo Anthony averaged 34.7 playing in three of the four. Luol Deng had his best scoring game of the season and averaged 25 in the four games while Jimmy Butler defending Anthony in the final game gave Anthony his most trouble defensively. Knicks players then bragged that unlike the Cubs their franchise won a title 40 years ago. The Knicks with the win over the Bucks also are one of the teams the Bulls are now chasing as the season winds into its grueling third day. Always the soap opera of teams, Shumpert is starting because J.R. Smith, last season’s Sixth Man winner, was suspended five games for violating the league’s drug policy. Smith then announced he should start. He also had offseason knee surgery, possibly in case he wasn’t suspended. 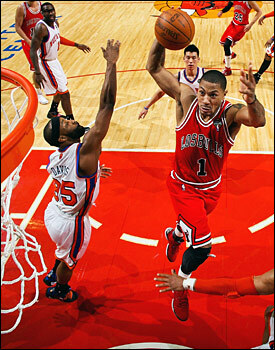 It being Halloween, the Bulls will be checking to make sure he’s not wearing an Amar’e Stoudemire mask. The Bulls are in the same building with the player formerly known as Ron Artest on Halloween? Now that’s scary. Stoudemire may make his season debut Thursday as he’s alternating back to back games with Kenyon Martin, who also has knee issues and played Wednesday. This would be the Knicks’ version of Ric Flair and Roddy Piper. Starting point guard Ray Felton aggravated a preseason hamstring injury Wednesday, but had to return late in the game to subdue the deer. So it’s time for Rose’s first Thursday game on a rainy day in late October when a Prigioni is in the building. Now that’s something to see.